A familiar problem for backyard chicken keepers and commercial enterprises for laying hens, is infestation of the birds’ environment with Dermanyssus gallinae, also known as red (poultry) mites. Compared to other poultry parasites such as fowl ticks, lice and flies, mites are by far the most common, most destructive and difficult to remove. Red mites are nocturnal parasites and hide themselves in all kinds of gaps and cracks during the daytime. This makes the treatment of red mites harder and more complicated. Red mites are up to 1mm in size. The title “Red” has been given to this mite as it turns from grey to red after it had a blood feed. Once the infestation becomes significant, your chickens will become anaemic. Their wattles and the combs will start looking pale and their egg production will drop significantly. Red mites also cause skin irritation, feather pecking, weight loss and restlessness in the flock. Because of the mites your chickens will probably be reluctant to go to bed, because that’s where the mites are! When checking your chicken coop for red mites, check the perch’s at the end and cracks and crevices. An even easier way to check is to run a white paper towel underneath the perches at night. If there are red mites, at this time they will be on the underside on the perch after feeding on your chickens and you will be able to see red streaks on your paper towel. Prevention is always better than cure. But this is not always that simple. Wild birds or new chickens can transmit red mites to your coop. It’s a good idea to check for red mite routinely when you clean your chicken coop and use some preventative treatment to the coop. For example, you can use Diatomaceous earth as part of the weekly clean (DE is a 100% natural powder which dehydrates parasites it comes into contact with). 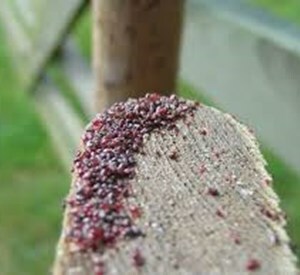 All types of chicken coops can get red mite, however wooden coops tend to suffer from infestations the most. Unfortunately red mites can survive for up to 10 months in an empty hen house, so leaving a coop empty for a while doesn’t usually fix the problem. Choosing your housing carefully can help prevent infestations. 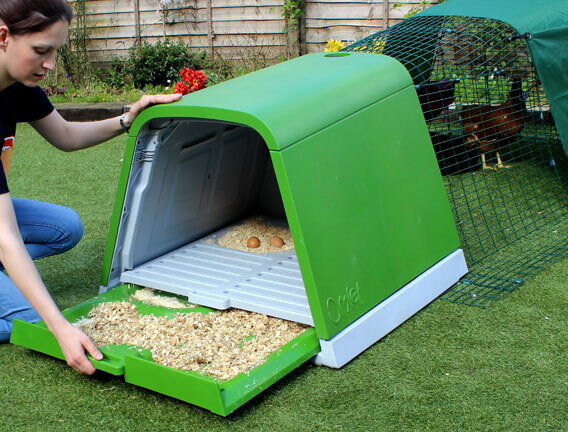 Omlet’s Eglu chicken coops are made from plastic which makes it very difficult for red mites to make a home. And in the event that there is a Red mite infestation, they are quick and easy to clean. A quick blast with a pressure washer should do the trick. If you find lots of red mite in the coop, it’s time for a big clean up. The initial clean out will take a couple of hours for wooden coops, with a plastic coop it will take less time. Remove all birds from the house and strip the house down as much as possible. If you have a felt roof you will need to remove this and have your coop re-felted. Mix a mite disinfectant detergent (such as Smite Professional Disinfectant 1 Litre Concentrate or Barrier Red Mite X 500ml Concentrate) with water (using the manufacturer’s guidelines). Apply this to the coop ensuring you get it in the cracks and crevices, concentrating where there are perch ends and concentrations of red mite. Leave for 15-20 minutes. Use a hose (preferably high pressure) to hose down the coop and the parts. Try to get in every nook and cranny as this is where the mites like to live. Leave for 10-15 minutes to dry. After this you will most probably see more mites, which have been disturbed, crawling out. Repeat this process until there are very few mites emerging after each wash.
Leave the house to thoroughly dry. It’s ideal to do the initial clean on a sunny day as the UV can kill some bacteria and will dry the house quicker. Put the coop back together and add bedding (dispose the old bedding in a plastic bag in a bin as the red mites will happily find somewhere else to live). Sprinkle the whole coop and your chickens with a red mite powder. Ensure you rub the powder onto the perches so any remaining mites will have to crawl through it to reach your chickens. Omlet stocks a large range of red mite powders and diatom powders to deal with red mite infestations. Humans Aren’t The Only Ones Suffering….Dogs Get Hayfever Too! Hay fever is a seasonal allergy, so the greatest problems will be during the summer and early fall. 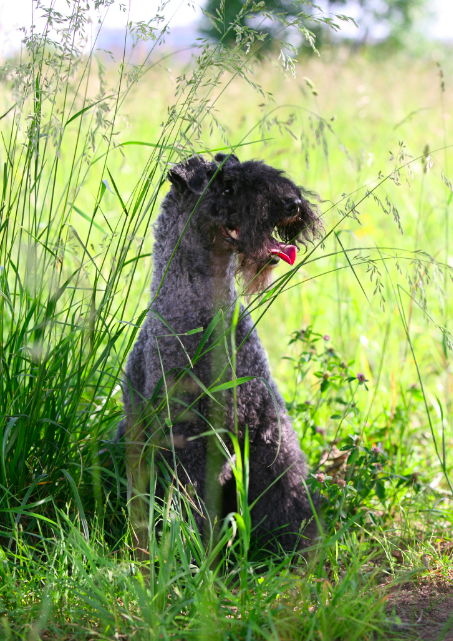 Some dog breeds seem to be particularly prone to hay fever, including terriers, poodles, schnauzers and the Dalmatian. Like humans, dogs can develop hay fever at any age although symptoms often begin when dogs are 1 to 3 years old. It can be difficult to figure out what’s causing your dog’s allergies, since the symptoms of hay fever are similar to many other things. Your vet can do allergy testing to identify if hay fever is indeed causing the problem. CAN CANINE HAY FEVER BE TREATED? • Keep your dog indoors as much as possible on days when pollen counts are high, especially on windy days. • Wash your dog’s bedding weekly with hot water and vacuum regularly to remove the pollen your dog picked up during walks. • Choose the areas where you walk your dog carefully, keeping him away from longer grass and vegetation. • Wipe your dog’s coat over with a damp towel immediately after a walk to remove any pollen. Start with the face and end with the legs and paws (your dog may have been running on grass, coming into direct contact with pollen). • Boost your dog’s immune system. By improving the general health of your dog allergic reactions can be helped. Make sure your dog has a healthy weight and a balanced diet. • Give your dog oatmeal baths frequently to sooth the skin and remove pollen. Oatmeal can give your dog temporarily relief from dry and itchy skin. Just poor one cup crushed whole oatmeal in a tub and stir. You can also use an oatmeal shampoo for dogs or other shampoo’s designed to reduce skin problems (although not so frequently that it dries out the skin). • For the rare cases where pollen allergy does provoke sneezing and runny eyes, eye and nose drops supplied by the vet can be effective. If none of the mentioned treatments prove effective, your dog might be a candidate for hay fever medication or allergy shots. Consult your vet for further information.